Henry Flint said he wanted to draw Dredd on horseback so Williams obliged. So slag it off as Henry Flint’s Horse. Q - Henry’s art on Titan really was just superb, with a Hershey who just bristled with pissed off authority in practically every scene. And then there’s the fabulous colouring throughout, including those really striking pages shot through with red emergency lighting. 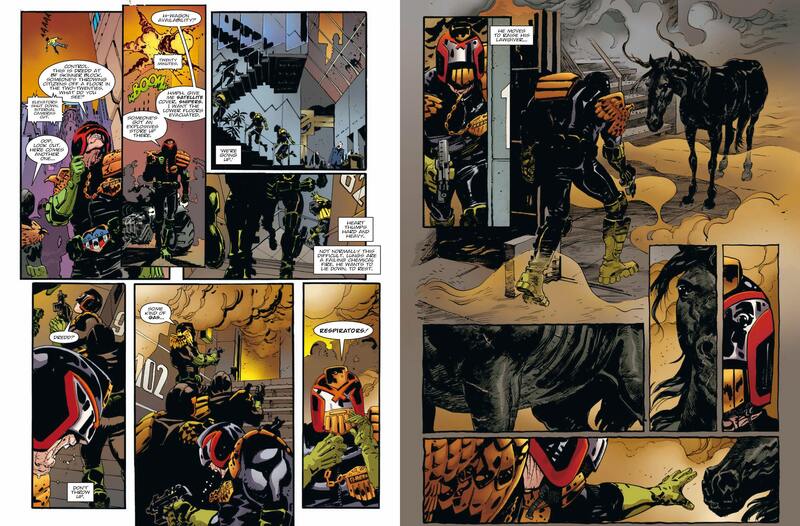 And that image on Dredd on horseback – a nod to Miller’s Dark Knight? RW: I think Henry said to me at one point that he fancied drawing Dredd on horseback. From this website, October 2018. I know, mate. What I remember Williams saying is that Flint asking to draw Dredd on horseback made him (Williams) think of using the horse he'd already introduced in that earlier strip. So, as Richard said earlier, Flint's the reason a horse is in there, but Williams is the reason it's a magic horsey. All horses are magic, as is friendship. Did My Little Pony teach you NOTHING?! All horses are magic, as is friendship. Did My Little Pony teach you NOTHING?! Arf! I should add I didn't have a problem with Dobbin. I don't think it was a masterstroke, but it was a style of storytelling the strip hadn't seen before - which, after 40 years, is something. They missed a trick in The Small House by not having Gerhart ride in from the Cured Earth on Henry Ford. BPP should be tied to a chair and forced to post incessantly in this forum. That's a good take-away from the story, though, innit? As Dredd is a clone he is part of the house. Retired clones have the option of the long walk or bingo caller at eldster clubs across the city. But the joke is that THEY are the sharks. I think. It IS Dredd's house...have you forgotten Dredd IS the LAW!